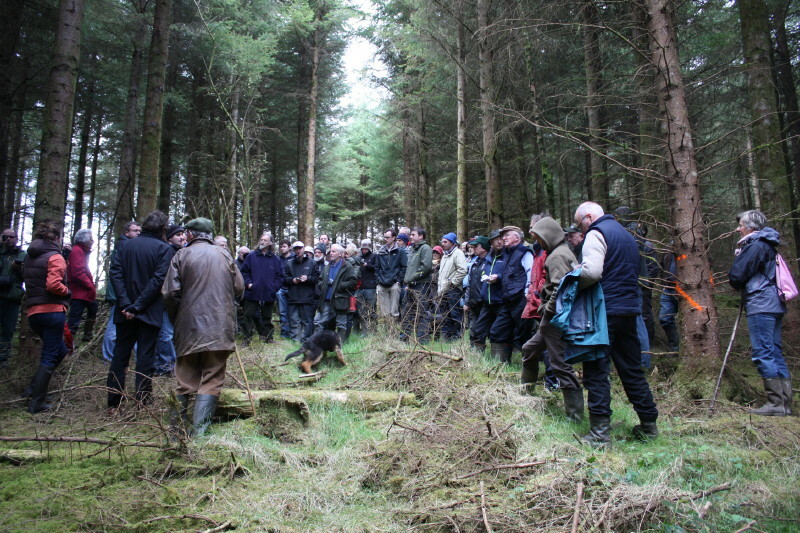 Upcoming ProSilva Ireland Continuous Cover forest study day in association with the Society of Irish Foresters – all welcome. Directions: Travel to Ballyhooley on the N72 between Fermoy and Castletownroche in Co. Cork. Take the road signposted Kilavullen and take the first road to your left immediately at the small roundabout after crossing the bridge. Take the first road to the left and starting point is at first forest entrance along that road. Continuous Cover Forestry or “Irregular Forest Management”* is a set of interventions (selective felling and cleaning operations) that is applied to a stand in order to maintain or transform a stand to a predetermined state (species mixture, standing volume, stand structure). At the level of the sub-compartment, irregular forest management aims not to create any form of spatial or stem size homogeneity. It aims to ensure good tree vitality, best possible timber quality, a wide variety of locally adapted species and continuous renewal”. During the morning session we will have three different stop looking at different aspects of transformation of even-aged forest to Continuous Cover Forest. Stop 1 will be in 1972 planted Western Hemlock compartment where we will discuss “Transformation to Continuous Cover Forestry at later stages in rotation”. Stop 2 will be in a second rotation forest that was reforested in 1988 and where we will discuss “Practicing CCF in Mixed High Forest in area of reforestation where Bi regeneration became dominant”. 12.30 -1.30 pm – Lunch. Participants are advised to bring a packed Lunch. In the afternoon we will visit the nearby Castleblagh property where the discussion will centre on timber quality, adding value and the economic aspects of managing forests under continuous cover forest. Stop 1 will be in two adjoining blocks, an SS forest, YC 24 and DF Forest, YC 22, both planted in 1988 and ready for second thinning where we will discuss “Transformation to CCF at early stages in rotation in SS and DF plantations and Economics of CCF”. An example of crown thinning will be demonstrated. Leaders: Pat Roche (Coillte), John Landy (Coillte) Pádraig Ō Tuama (Coillte and ProSilva Ireland). Andy acts as a manager for a number large private estates in Southern England. He is particularly experienced in managing sites with high nature conservation and heritage values. Other areas of specific expertise are broadleaved silviculture and mensuration in Continuous Cover stands. ProSilva Ireland promotes forest management strategies which optimise the maintenance, conservation and utilisation of Forest ecosystems in such a way that the ecological and socio-economic functions are sustainable and profitable. The general approach to management which is advocated by Pro Silva includes market and non-market objectives and takes the whole forest ecosystem into consideration. 4. Recreation, amenity and cultural aspects. Forestry Focus Covering all aspects of forestry, this website gives the reader an easy to understand overview of the Irish forestry sector, while at the same time, providing access to more detailed information on topics such as trees species, growing forests, wood processing and the public goods and services that our forests provide. The kind assistance of Coillte in organising and hosting this field day is gratefully acknowledged. This event is worth six Society of Irish Foresters CPD points.